New ways of connecting airports, such as a high-speed rail link between Heathrow and Gatwick, are to be considered in the coming months as the government reviews its aviation policy. A 180mph (288km/h) train service between the two locations has been proposed, The Times reported. And the multibillion-pound idea is to be studied by ministers, the Department for Transport (DfT) has confirmed. But Heathrow's operator, BAA, said it "provided no extra runway capacity". The idea also faced "seemingly insurmountable technical, operational, political financial challenges, and would take many years to deliver", the company added. The scheme, which would create a so-called "virtual hub" running from west London to West Sussex, was welcomed by Gatwick Airport, however. Anything which provided "short to medium-term alleviation of capacity issues in the South East" should be considered, although the funding and route would need careful consideration, a spokesman said. The issues of aviation congestion, and links between airports, have been frequently discussed in recent months. Among the ideas is a £40bn terminal in the Thames estuary - nicknamed "Boris Island" after London Mayor Boris Johnson - several miles off the Essex and Kent coasts. 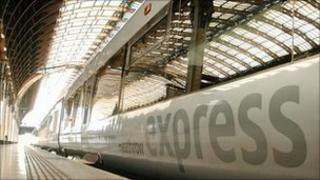 There has also been debate about extending fast train services to Heathrow. Currently Heathrow and Gatwick are linked only by road, or by travelling into London and back out again by rail. The DfT said ministers wanted a policy "which supports economic growth while addressing the environmental impacts of flying". Among the considerations were "the importance of a UK hub airport and whether it might be possible to create a 'virtual hub' by improving connectivity between existing airports", a spokesperson said. "This proposal will form a useful contribution to the debate and will be considered alongside all other responses."